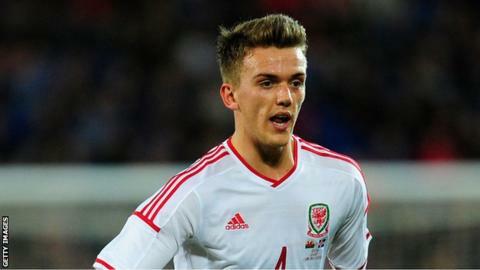 Emyr Huws made his debut for Wales in a 3-1 win over Iceland. Emyr Huws is out of Wales' squad for the Euro 2016 qualifier against Bosnia-Hercegovina. The 21-year-old Wigan midfielder was struggling with an ankle injury before joining the squad. Manager Chris Coleman is now without 10 players for the crucial match in Cardiff on Friday, 10 October, but believes his squad has the strength to cope. "Whoever we have, the players are good enough," he said. Amidst the injury headaches, Coleman does have Real Madrid star Gareth Bale available, with the winger hoping Wales can make history. Meanwhile Coleman has confirmed Huws is to have a scan on his ankle injury. Wales beat Andorra 2-1 in their opening game and face Cyprus in Cardiff on Monday, 13 October. The injury to Huws leaves Coleman's squad severely weakened in midfield with Arsenal's Aaron Ramsey, Liverpool's Joe Allen and Nottingham Forest's 38-times capped David Vaughan already ruled out. Former Swansea City player Allen has not played for Liverpool since suffering a knee injury in Wales' win in Andorra on 9 September, since when it is believed he had a double hernia operation. Defender James Collins missed the opening Euro 2016 qualifier in Andorra with a groin problem and has not recovered.